Bloggers Who Have Inspired Me - Link Up. Happy Bright, Beautiful 2nd Tuesday of June everyone!! Today I am co-hosting the Tuesday Weekly Link-up Hosted by the Lovely Rachel from Garay Treasures. By now I consider Rachel a friend of mine, though we have only met via blogging. This sweet mamma of four very young ones finds time to blog about anything and everything from her personal style, to her family and her faith, yet leaves the sweetest comments and always makes time to socialize with other bloggers. If you do not yet follow her, please do - she is truly a beautiful person. So before I get to my outfit today let's meet Rachel and also below you will find a short description about me and my blog. Bloggers Who Have Inspired Me" link up: Meet your Host: Rachel of Garay Treasures blog Rachel is a former full time preschool special education teacher turned full time stay-at- home mom of four children with a passion for substitute teaching and blogging at Garay Treasures on the side. Garay Treasures is a fashion and lifestyle blog with some added posts on faith and everyday treasures. Rachel loves drinking several cups of coffee a day (hot or iced), blogging, and reading and playing with her children. You can follow Rachel by bloglovin, Instagram, Twitter, Facebook or Pinterest. 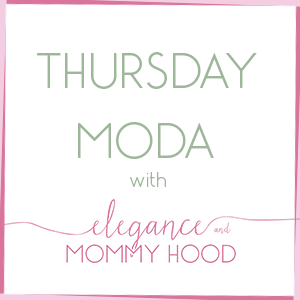 Meet your guest co-host Ada of Elegance and Mommyhood. "Hey there Rachel's readers. I am Ada and I blog over at Elegance and Mommyhood. I have been blogging full-time for a little over 3 years now and like my blog title says, my blog mostly reflects my everyday style and everyday snippets on life and mommyhood. My toddler Vivian is a big part of my blog as well and a lot of times takes part in my photo-shoots as well as her own. I am a real woman on a real budget and I am a budget-conscious fashionista, too. Almost always my outfits never exceed the $130 head-to-toe price. So if you are looking for everyday mom style and cute little girl's outfits you have come to the right price. I welcome you to check out my blog. This blogging community is all about meeting fun, fashionable, wonderful women with whom we have similar styles and life-styles and that is my most favorite part of blogging, besides sharing what I wear daily. Nothing fancy, just simple chic styles that fit my day-to-day life and my modest budget. You can follow me via Bloglovin, Google Friend Connect, Google + and Pinterest. Thank you for stopping by." Jan linked up a casual running errands look that I found to be super cute. Converses, cut off shorts and fringe- say no more! You can view her outfit here and new hair style. Denise almost always inspires me to try a cut off shoulder dress or blouse and while she linked up a few this was my favorite! I just love the crisp clean white and neutral colored accessories with a pop of blue. See the outfit details here. Andrea posted a style inspiration for styling camo pants. I didn't include the shoes in this shot because you are just going to have to visit her post here to see what she did include. I just love this ladies beauty daily! Iris linked up a lovely dress from a former store called Cache. While Cache is no more she made me think of stores in my Ghost of "shopping" past that I loved and miss (Rave, local consignment stores). What are some of the stores you miss that closed? Read her post here to find a list of other stores missed. Krista inspired me to try local dairy farm products as she noticed with her butter from the dairy farm there were only three ingredients in it versus our store bought 20 plus ingredients (say WHAT). I don't think I have ever had local dairy farm butter so this inspired me to try some. Krista's post is about a day spent on a farm with her little family, and what a cute outfit too, I might add. Read the post here about their farm adventures. And now onto my outfit! The real reason why you are here, not? Last week I wore some of my Light Spring Sweaters (and a few Sweater Dresses also - which I will show you soon) due to cooler temps. This Pastel Floral one makes a second appearance on the blog. It was first worn about a month ago and looking at the two outfits, they are similar. Since last time I also paired it with Ponte+Faux Leather Leggings albeit in Black and both Outfits are slightly dressy, too. Just like I did lately with this Semi-Dressy Pastel Look I paired my Pastel Sweater with Skinnies and carried a Clutch. The one from today is new, a Birthday Gift to me from a Local Boutique (Thank You) and I am in love with it. It is real leather, very soft, in a rich gold color and with the prettiest bow. It comes with a removable gold chain to carry as a long shoulder strap, also. It is hard to see also but I layered a Plum/Maroon Beaded Long Statement Necklace with a Dainty, Gold-tone Pyramid Necklace. Last but not least for late Spring/early Summer I can count on my peep-toes to be worn lots with my outfits. So I am linking them with LAURA for "Trend Spin" which today is Summer Shoes. I ended up loving this elegant, semi-dressy, put-together look worn to the class I teach and running around in the city, with Vivian. It is all about the little details: The Maroon Dotted Glass Beaded Necklace brings out the speckles of Maroon/Plum from my Sweater and the Bows on my Peep-toe Wedges had Gold Sparkly Pave Stones which go with the Gold Clutch. Blush/Beige Pastel Floral Sweater: Nordstrom Rack (New; c/o Mom) (similar, Splurge, love this), (similar in neutral gray, great deal), (similar in blush w/ pink roses, best deal, love this). Navy Ponte, Jersey & Faux Leather Skinny Pants w/ Quilted Panels on the front: A Boutique in Tirana (very similar, best deal), (similar, textured, on sale), (ponte option w/ zipper detail by J.Crew, great deal, love these), (capri option). Gold, Envelope-shaped, Real Leather Clutch w/ Bow: c/o a Local Accessories Boutique (New) (similar, best deal), (gorgeous option by Loeffler Randall, on sale, love this), (similar by INC, great deal, love this), (stunning metallic option by MK, on sale). Leanne, Lindsey, Liz, Madeline, Meg, Rebecca, Saumya, Shanna, Stylish Housewife, Vicki and Zaz.